Why does your business need a CRM in the first place? Home » Why does your business need a CRM in the first place? Customer relationship management (CRM) is a term that refers to practices, strategies and technologies that companies of any size use to manage and analyze customer interactions and data throughout the customer lifecycle, with the main goal of improving business relationships with customers, helping in customer retention and growing sales. CRM systems are designed to collect customer’s information across multiple channels, which could include the company’s website, telephone, live chat, direct mail, marketing materials and social media. CRM tools with marketing automation capabilities can automate repetitive tasks to enhance marketing strategies to customers at different points in the lifecycle. For example, as sales leads come into the CRM system, the system might automatically send them marketing materials, typically via email or social media, with the goal of turning a sales lead into a full-fledged customer. Why you should use a CRM? Your customers are very important to your business. No matter what your industry is, no matter what’s your focus on, no matter what kind of products or services you sell, your customers are the most valuable asset of your company. CRM tool is a must for any company that wants to take customer satisfaction to the next level. the list goes on and on, but the main concept is, the better customer relationship, the easier it is to conduct business and generate revenue, therefore using technology, in this case a CRM tool makes good business sense. How does CRM terms relate to your business? What is a lead in CRM? A Lead is a contact or an account with very little information. It could be just a person who you might have met at a conference, or someone you have captured data in your website contact form, or someone coming from a Facebook ads campaign. The Lead entity is often thought of as a temporary entity, as the sales process progresses, a lead is ideally converted to a Contact, and then a Deal/Opportunity its created for this contact, which your sales team work on it toward the deal close/won. What is a contact in CRM? A Contact designates an individual who has purchased your product or service or a company representative responsible for purchasing or negotiating deals with your organization. Contacts are typically associated with companies (accounts) and deals (opportunities). In difference to the lead, a contact entity is a permanent record within CRM system which has a completed profile as an well known individual. What is an account in CRM? An Account is an organization/company which you have a relation with. These accounts you have relation with, might be a vendor, a partner or your client. While it all depends by your unique business processes, typically the general concept is that the account is a single location and the contacts related to the account are those who work at that location. CRM systems are designed to be flexible for B2B or B2C scenario, so you would definitely need to customize for your unique business processes. What is a Deal in CRM? A Deal is an opportunity to sell your products or services. Some CRM systems use the term opportunity instead of the deal, but the concept is the same. Deals typically are split into custom deal stages, which are used to visualize sales pipeline and to estimate future revenues. Based on your services or products you sell, you can always customize stages in a pipeline, while having the option to have multi pipelines based on your lines of products or services which may require different sales flow. While there are a lot more on a CRM, which different systems offer extended modules, the base concepts to understand are the above which highly relate to each other, Leads, Contacts, Accounts and Deals. Why is a CRM worth it? In a customer-centric world, a CRM is the perfect choice for every business – regardless of size. A CRM automates every day tasks, but not only: it is the perfect choice when it comes to making your marketing campaigns effective. By using a CRM, you can manage all business relationships: the relationship with your potential and existent customers, business partners, contacts, employees, etc. The more satisfied your customers are, the more they will trust you. The more they trust you, the more will your brand grow. A CRM helps you organize everything within your business. The cost of a CRM is insignificant compared to the huge benefits that it brings, especially in organizing work better and improving the effectiveness of your marketing efforts. You can build your own success story, starting now with Flexie CRM. In your day-to-day activities, you and your team may need to carry out a lot tasks. Without a proper system, your marketing efforts may fall short. True, you may still get results – but at what cost? What about communication within your organization? Without a proper platform, you may lose a lot of precious time on tasks that could be easily automated with a CRM. The same goes for your marketing efforts. Why send an email to each one of your leads when you could easily send them automatically from the CRM? Why switch between multiple email accounts when you could easily have all email correspondence into one single place? Why search for a specific lead through massive sheets of paper or Excel spreadsheets when you could easily find them by using filters? Why struggle to make sense of massive amount of data when you could easily build custom reports and get huge insights from personalized dashboards? By automating repetitive tasks, you free up time for other things. 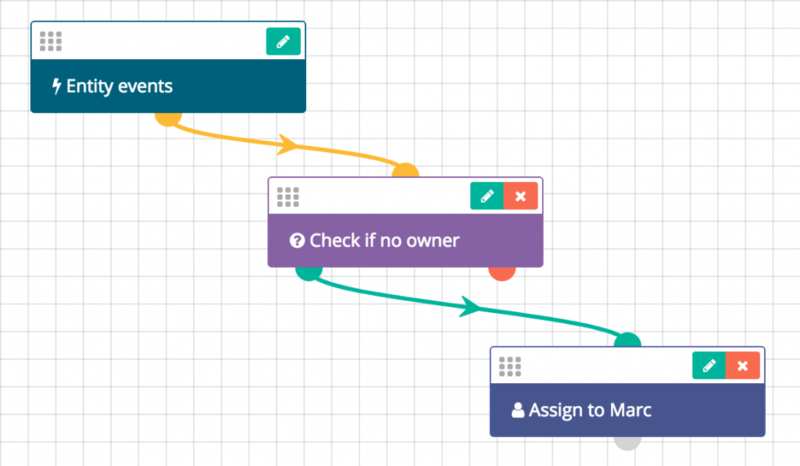 In Flexie CRM, you can build workflows to automate literally everything. For example, you can execute actions upon a lead submitting a form, opening a marketing email, visiting a page, etc. You may share leads with other users within Flexie CRM, add or subtract points, send follow-up emails, send web/sms and email notifications to users or groups within the CRM, update them, etc. You can build workflows on any entity (lead, contact, account, deal, cases and custom entities). By automating marketing and all the other processes within your organization, you can convert more leads, close more deals and improve efficiency and communication within the company. Deal management is a vital element in business. In Flexie CRM, you can build multiple pipelines. A pipeline is an accurate visual representation of deals, where do they stand and where are they headed. In Flexie CRM, you can build a fully customizable pipeline. As today’s global market becomes more and more competitive, you need the right platform to increase your revenues, improve sales processes, manage all kind of business relationships, automate repetitive tasks and marketing and deliver a great customer service. A CRM is, by any mean, the best tool to take your business to the next level. Accurate and up-to-date analytics are vital in an ever-competitive market. With Flexie CRM, you can create create custom reports about virtually anything: sales performance, deals closed, lead conversion, etc. You can use multiple dashboards to manage your team and get valuable insight into your business. The interactive and highly intuitive dashboards allow you to see how your company is doing, and accurately predict revenues through custom reports you create. Dashboards in Flexie CRM are fully customizable, allowing you to create your own dashboards, so they fit your business’ needs. Have you ever wondered how much time is lost looking for a specific email, or switching between several email accounts? What if you could have all email correspondence into one single place? Flexie CRM has turned this into reality. Thanks to the IMAP protocol, you can now use Flexie as an email client, managing multiple mailboxes within same Flexie user account. What does that mean for you and your business? It means saying goodbye to switching between multiple email accounts. You can send, receive from Flexie’s Mailbox, without having to leave the CRM. You no longer need to switch between Flexie and your custom email accounts. Full Email (IMAP) Integration to make your life easier, to give a huge boost to your marketing efforts.